★Please connect the device to the direct USB port on your computer.If you connect it to a USB hub or extension cord, it may not be able to identify the driver or read the CD/DVD. ★For a desktop, connect the device to the USB port on the motherboard for normal use. ★The newly released Windows system has stopped the internal DVD media player software, and customers use Windows 10 and above to install VLC media player to play DVDS and CDS. ★Make sure your computer has a "media player" before you use the cd-rom drive. 【Dual Interface】：This drive is equipped with a standard USB2.0 interface and a type-c interface.The standard type-c data line can be directly inserted into the type-c computer port regardless of the positive and negative directions, which enhances the usability of the computer. 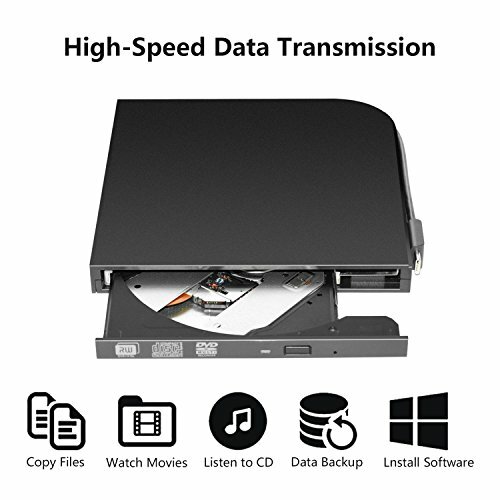 【Intelligent Design 】：This external DVD drive USES unique intelligent combustion technology, equipped with a new chip with powerful error correcting capability, music and movies played without delay or distortion. 【Customer Service Guarantee】：We believe in our product quality, in order to provide you with the best customer service!We use a 90-day warranty to support it. If you have any questions about this product by tengertang, contact us by completing and submitting the form below. If you are looking for a specif part number, please include it with your message.